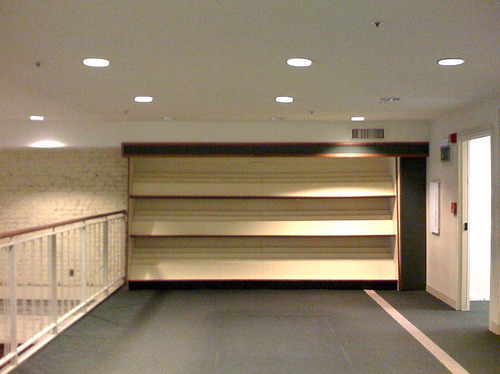 The abandoned mezzanine level of Stacey’s Books, photographed by Merlin Mann, who has posted the above photo and some reflections on the closure here. When this news was announced, I had a feeling that it was the rent that killed them, and Mann’s post would seem to confirm it: he reports their rent as having been $65,000 a month. That’s a lease of $780,000 a year. You just try to run a bookstore, of all things, with an expense like that on your P&L. Given that they had too much space in a prime retail space, I still wonder why they didn’t choose to relocate. That question has puzzled me from the beginning. If you happen to know the background of this choice, please let us know in the comments.